What does it take for men and boys to reflect about manhood? In the past decades, many women’s rights advocates have learnt that improving the health and wellbeing of adult and young women also requires engaging men, adult and young. Program H is an evidence-based project that started in 2001 in Rio de Janeiro, Brazil. It’s an action learning set of resources that focus on masculinities and their perception. The material is meant to be an inspiration, a source of discussion that is importantly highly adaptable. In 2014, as winners of the inaugural Womanity Award, the Lebanese NGO ABAAD and Promundo tied another partnership to replicate Program H in Lebanon with a view of disseminating it further in the MENA region. In October of the same year, ABAAD and Promundo completed their first learning visit to the Balkans, adapting the program to a post-conflict setting. In 2015, ABAAD commissioned the translation of Program H manual, and completed a series of expert review meetings to critique and adapt the content manual to the MENA context – as a replication is never a one-size-fits-all process. Following this work, the team decided to use 12 units of Program H, using the Balkans’ adaptation as a model, as its context included elements of sectarian violence similar to the situation in Lebanon. Simultaneously, ABAAD co-designed MenEngage Lebanon’s strategy, to develop their recently established collaborative network with autonomous local and international member organizations promoting human rights and gender equality, and to boost their capacity. In December 2015, a capacity building session with MenEngage, facilitated by Promundo US, took place in Beirut. Participants learnt about methodologies to measure and evaluate programs, and explored MenEngage’s best practices on conducting advocacy and developing strategic partnerships on engaging men and boys. In January 2016, ABAAD conducted a one-week validation workshop with partners from MenEngage Lebanon, facilitating 12 to 14 Program H units with trainers who acted as the young men, and collecting another set of feedbacks and insights in a truly collaborative process. In February, representatives from ABAAD, their local partners in Beirut from Save the Children, Promundo-US, the Womanity Foundation, and a representative from the youth organization Centar E8 (a youth organization focused on work with young people across Serbia) flew to Rio de Janeiro in order to learn about how Promundo Brazil implements Program H.
The visitors met with Promundo’s monitoring, evaluation and research teams, as well as a few service users, to understand the challenges and lessons learnt relating to the Program H methodology. This replication project is a true tribute to the power of co-mentoring. The Program H manual has been translated into “white” Arabic, which is a variation of the language generally understandable within all settings in the MENA region. One challenge is finding an accurate translation for ‘masculinities’ – the term that existed literally translated into “patriarchism”. Therefore, the team had to figure out a new way to express this term! 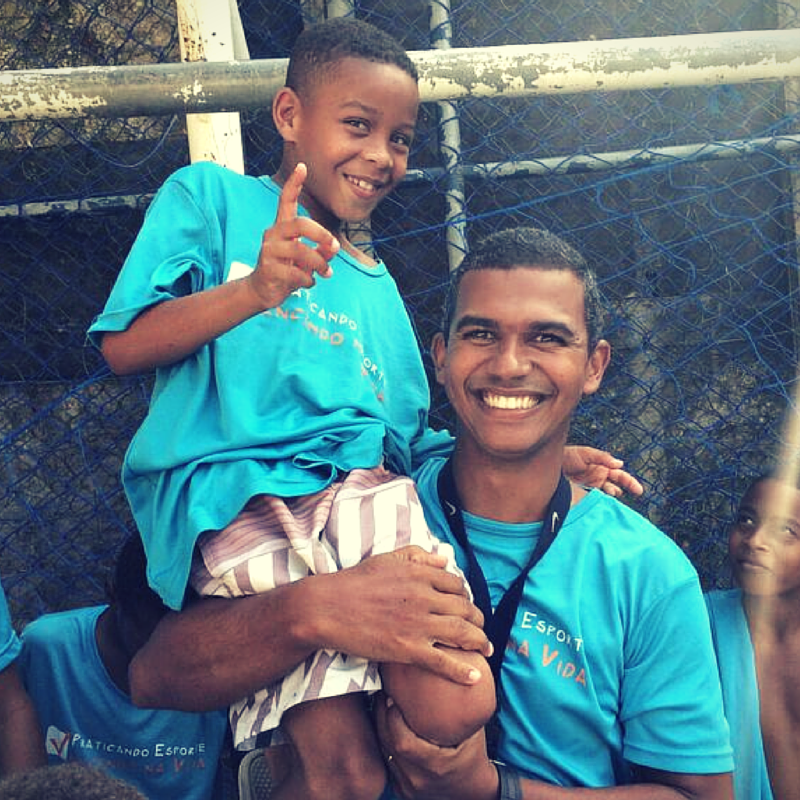 Throughout their experience with Program H, Promundo Brazil have been aware that some topics are difficult to cover, such as fidelity, abstinence, polygamy. You need to talk about these topics at meta-level and mention “relationships, respect, health, violence prevention, and rights.” At times, Promundo tries different ways to articulate a specific topic, but the audience doesn’t recognize the concept. Take sexual exploitation for instance. In this case, you can turn the concept upside down: you mention “sexual rights of young people”. Beyond the replication of various Promundo programs and researches, ABAAD also runs the “Men’s Center”, from which they provides free psychological counseling to men from refugee populations. ABAAD does not just do masculinities work, they are experts in gender equality and early prevention programs. They run emergency response programs via safe houses, they also provide mental health and psychosocial support, as well as sexual and reproductive health programs. Other projects aim to show how to use active non-violence in promoting gender equality. They are also go-to spokespersons for masculinities/feminist perspectives on militarism, security, working with WILPF (Women’s International League for Peace and Freedom). This expertise enables ABAAD to have an on-going co-mentoring dialogue with Promundo. Even if funding is not available, having access to institutions like schools, or clinical settings, enables you to access service users and collect data for impact measurement purposes. Evidence of a successful program will form the basis of a solid “business case” to apply for funds later on. “It’s important to maintain good relationships with corporate infrastructures too. You can become a preferred provider for capacity building, and policy building purposes”, says Vanessa Fonseca, Program Officer at Promundo Brazil. Promundo has an extended experience working with corporate social responsibility, e.g. with the oil company Petrobras, addressing sexual exploitation in major companies. Promundo has provided training to staff members, raising awareness around sexual exploitation of children. Promundo also worked in communities where the company has sites, training professionals on how to deal with issues, and providing methodologies to support families. This scheme was part of a bigger national campaign the government promoted to companies working on large infrastructure projects. From that insight, I gather that mentoring without a certain level of sponsorship has its limits. Promundo’s team introduced the approaches to developing monitoring and evaluation (M&E) indicators, tools and methods of analysis. The process and the concept of “transformation” will vary from country to country. Different observations from workshops on masculinities show that participants often repeat the facilitators’ words, when giving feedback or observations. So the question to ask yourself is: How do you know your participants internalized the process of change? How can a facilitator encourage the audience to develop their own discourse? “As organizations deploy Program H in their communities, they can use its innovative Gender Equitable Men (GEM) Scale for evaluation before and after interventions and campaigns to assess their effectiveness. The GEM Scale is a validated attitude scale that has been adapted and applied in more than 20 settings and has shown to be highly useful as an instrument to assess attitudes about gender,” states Promundo. Promundo also use video and storytelling to encourage young people’s expression. They insist that evaluation should also measure the “inventive capacity” of the participants. Promundo team members also encourage the idea of collecting data using technology, to avoid loss of crucial information, and to keep a uniform measurement process throughout all replication settings. Womanity is convinced that learning visits form an essential element of the replication process. Teams reinforce their relationship, exchange best practices, define and clarify culturally sensitive concepts, but also look back at their own situation from a different perspective. It is also a chance for organizations involved to promote opportunities across projects. Work practices in different cultural settings need adjustment too, and these visits allow to brush off potential communication issues. During the learning meeting, the teams were keen to explore different ways to use arts, communications and even technologies, beyond what is suggested in the manual, in order to implement the curriculum with young people. We looked at graffiti; we looked at football and Capoeira, as diverse forms of expression. Diverse forms of communications can also be used when users are giving feedback, rather than just sticking to written surveys. Outreach was a major question for the visitors. Students we met during the learning visit reported that seeing changes in the thinking of their peers, and the relationships that they form within the groups was motivating for them to join one of Promundo’s programs. It triggered a sense of curiosity: young people were seeing their friends joining this “cool group.” A male student reported that in the beginning, he did not want to be left out. A young woman noted that she joined despite the fact that her mother didn’t agree with some of the principles associated with healthy sexuality. We are looking forward to the coming months in 2016, as ABAAD and Promundo develop their co-mentoring relationship, and where boys and men will make their mark on Program H’s replication in Lebanon! The Inaugural Womanity Award is kindly co-funded by th Trafigura Foundation.